Encouragement and positivity are what our studio is built on and we pass this along to each of our students. 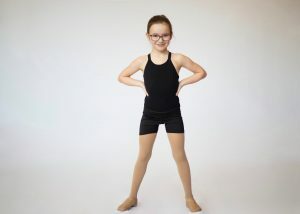 At this age, please keep your dancer happy and comfortable. Shorts and a t-shirt, leggings and a tank top or a ballet dress/bodysuit are perfect. Clothing that is not baggy or restrictive is the key. Bare feet OR ballet/gymnastics slippers, please. 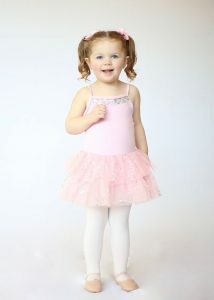 Girls: black dance bodysuit, white/ballet pink tights. *Dancer’s not properly dressed for ballet classes will be asked to sit out. All hip hop dancers must wear INDOOR sneakers for all hip hop classes to protect their joints. 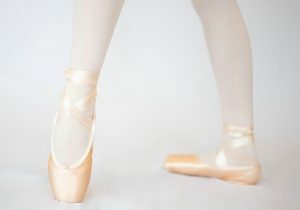 Pointe shoes may only be purchased after the dancer has been properly assessed by their instructor and must be purchased in a dancewear store that does professional fittings. Dancers not yet assessed need to wear their ballet slippers. *Dancer’s not properly dressed for pointe classes will be asked to sit out.